You'll want your bar countertop to be high enough to fit bar seating as well as leg room for entertaining guests. 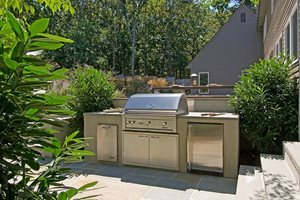 When determining the ideal size of your outdoor kitchen it is helpful to think in terms of zones. 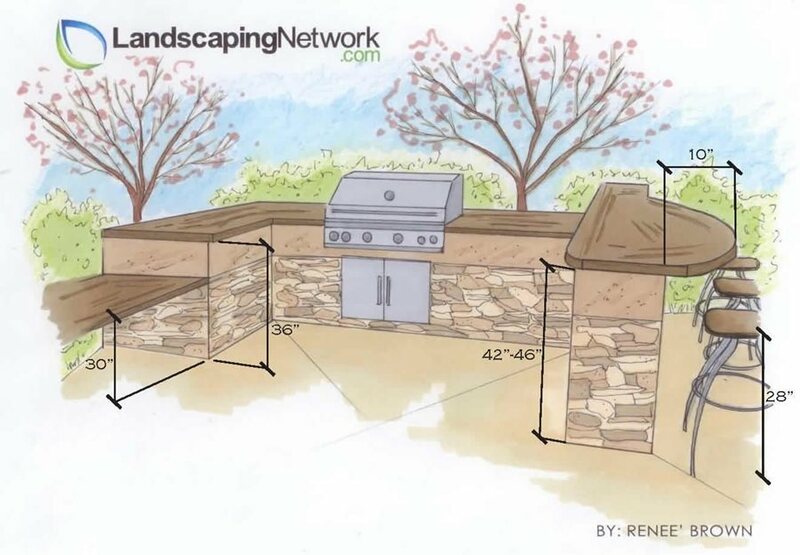 In order for you to get the most function out of your outdoor cooking space, it will need spaces designed specifically for food preparation and cooking, andfor dining and socializing. The size of these zones will vary depending on how you plan to use the space. 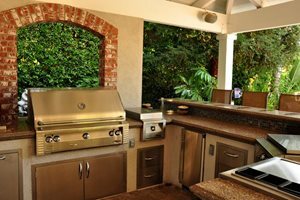 The hot and dry zones are necessary in even the smallest outdoor kitchens, while the cold and wet zones will be found in larger designs. For larger kitchens, the zones should be set up to make movement within the primary work triangle, grill-sink-refrigerator, easy and unobstructed. 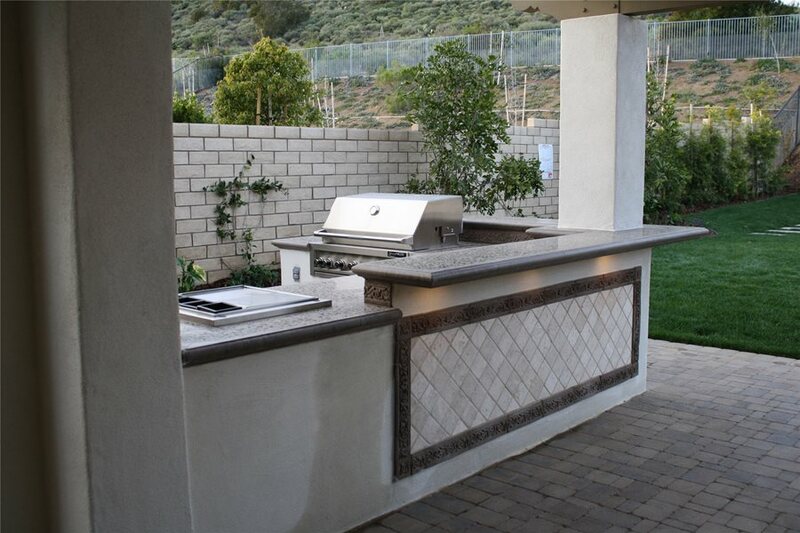 Pro Tip: Don't undersize your outdoor kitchen areas - make them large enough for entertaining. When you have company over people always head out towards the food, it's where they hang out. 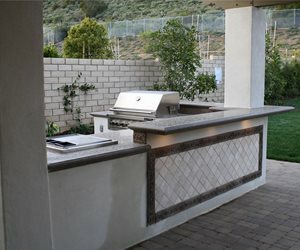 Before determining size, decide on the amenities you will include in your outdoor kitchen. 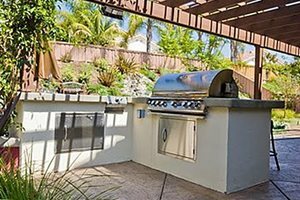 Your amenities list may include a grill, a side burner, a sink, and a refrigerator (see Appliances & Accessories for a list of all outdoor kitchen amenities options). Plan for at least 16 inches of countertop space between each amenity. This will leave enough space to set a serving platter. Kalamazoo refers to these spaces as landing areas, stating that, "There should always be landing areas to the left and right sides of a grill and sink." Additionally, if a caterer or bartender will be utilizing your outdoor kitchen frequently, allow for 3-4 feet of working counter space. 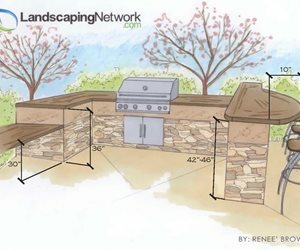 An outdoor kitchen perspective drawing showing standard counter & bar heights.